The politics of forests can never be disengaged from the condition rural India is in. A disconnect between the two has caused irreparable harm and continues to do so even today. 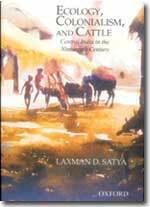 Laxman D Satya's second book, Ecology, Colonialism and Cattle provides ample evidence of this. The book is a study of the impact of the colonial takeover of forests and grazing lands and its consequences on rural life, agriculture, ecology and public health in Berar, situated in the watershed of river Purna in central India. The region today is a part of Maharashtra. Satya builds his case slowly, even painstakingly. He ferrets out numerous facts to put across his point: the takeover of forests and commons in cattle-rich Berar by colonial rulers destroyed the dynamic equilibrium that drove the agrarian life here. Lord Dalhousie annexed Berar, part of the Central Indian wheat and rice belt, in 1853. Till then, about 2 million people in this area, that stretches over 44,000 sq km used to grow cotton for subsistence. Millets, pulses, sugarcane, tobacco, opium and betel leaves were the other major crops. It was a land of abundant water, vast tracts of uncultivated pastures, babul bans (babul -dominated forests) and other forests. Large numbers of cattle grazed freely over the large open access terrain. The population was scanty and served by a well-planned and skillfully-maintained water system of dams, anicuts and reservoirs. A planned disaster The colonial rulers mapped the entire region, surveying it for mineral and natural resources. A system of revenue collection in place, they declared all 'non-remunerative' lands as wastelands -- land that people had till then used as common pastures. A new land system came into place: izaradari . This along with the ryotwari system completely changed the rural landscape by turning commons into private holdings on which the government pushed for more and more cotton. Simultaneously, the forests were 'reserved' and people denied access to it; the water works were neglected till they become dysfunctional. Most grazing land soon disappeared . The cattle had either to be stall-fed or grazed in the hills. The well-tuned agroforestry system of the region crashed, leaving people vulnerable. The resources that the forests and the commons would have ensured -- fodder, fuelwood, water and fertile soil -- during this time of stress were not available. Therefore, when monsoons failed in 1899, Berar suffered a devastating drought. Consequent famine broke the region's agricultural backbone. More than half the cattle in Berar perished and agriculture was abandoned in large tracts. Disease and death gnawed at rural life. Instead of providing relief, the colonial set-up devised plans to control cattle population -- taxing each cattle-head, putting in strong measures -- and entire villages were quarantined in the name of cattle-disease management. People began to hide information on diseases, consequently. So public health deteriorated even further. Successive rainfall failures soon turned Berar from a prosperous self-managed region to a living black hole. Reality check The story of Berar is the story of much of rural India, today. But one grim truth makes it even worse: the perpetrator of ecological madness -- the appropriator of commons and forests -- is our own democratically elected government. Satya pieces his story brilliantly. The author must be commended for two reasons. One, a historian by profession, he shows a deep understanding of ecology and its politics. Much like scholars of any new discipline, environmental historians have to almost always find the 'big picture' on their own and then reconstruct it out of sporadic facts hidden in swathes of documents. One would strongly recommend that conservationists take tips from this historian. Two, Satya recreates his story with such elegance that one almost fails to notice the innumerable references that populate the footnotes. In recent years, there has been a remarkable documentation of South Asian environmental history, that of India in particular. The discipline has acquired the richness of detail. This well-researched book adds considerably to that.